At the end of March, I had some time in Radium with my family. 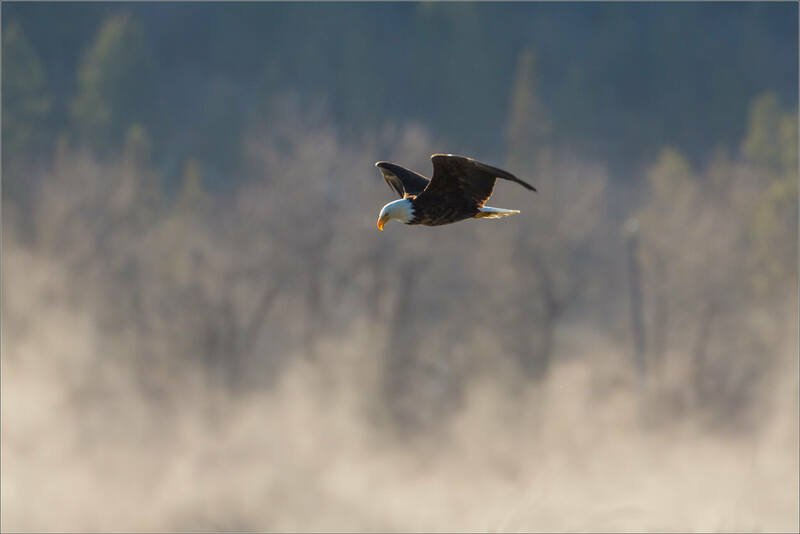 I spent the mornings meandering along the Columbia River as well as some of the valley’s ponds and puddles. This area of British Columbia seemed a couple of weeks further into spring than my home in Bragg Creek in Alberta. Green was starting to show on the trees and in the grassland. And on one lake, ice was still covering most of its surface. The open water offered fish and the ice had some kind of insect, slug or some such on it. 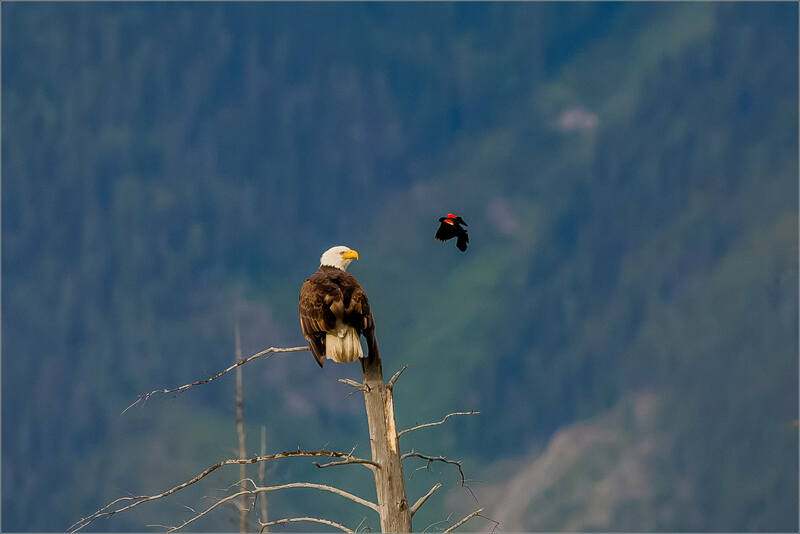 Ravens and bald eagles were drawn in by both. Over a couple of days I had some great opportunities to watch both and their occasional interactions. 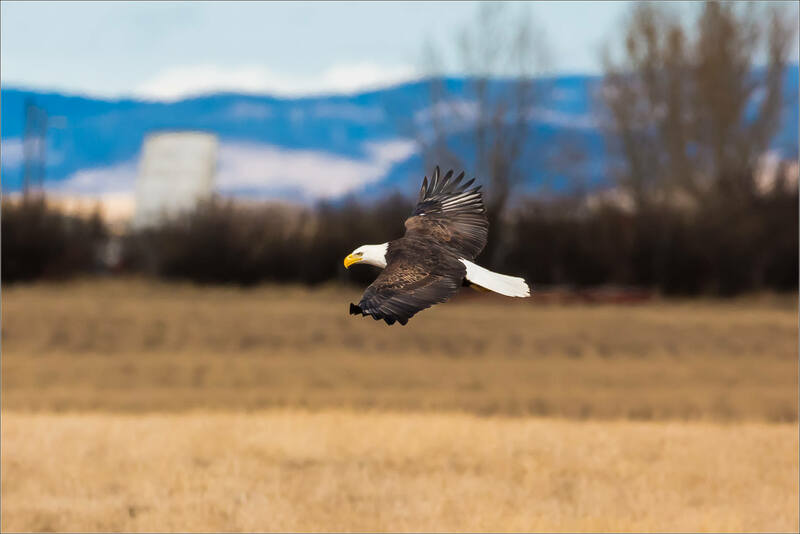 A few weeks ago, there were several bald eagles hunting for prairie dogs in the fields west of the Springbank Airport. I’m not sure if these rodents were just coming out of their holes, the eagles were migrating through or something else was behind this congregation. 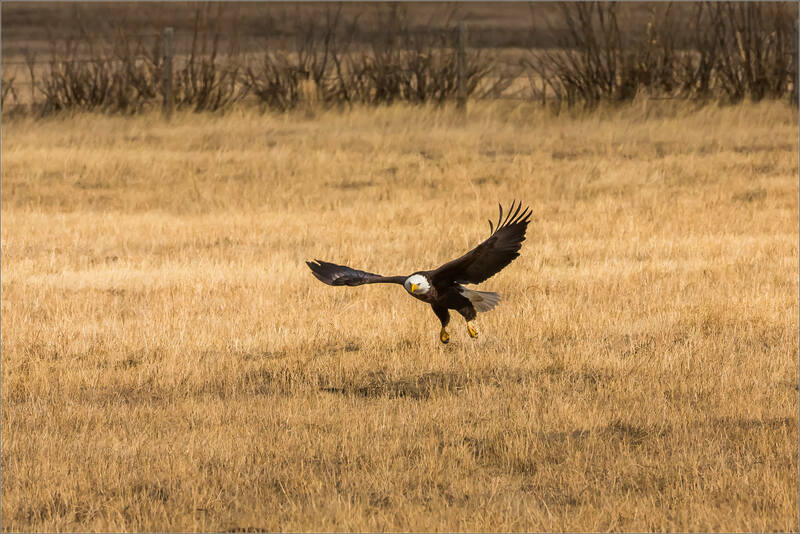 No matter why, the eagles were making hunting runs on the far side of one field at one point in the afternoon. 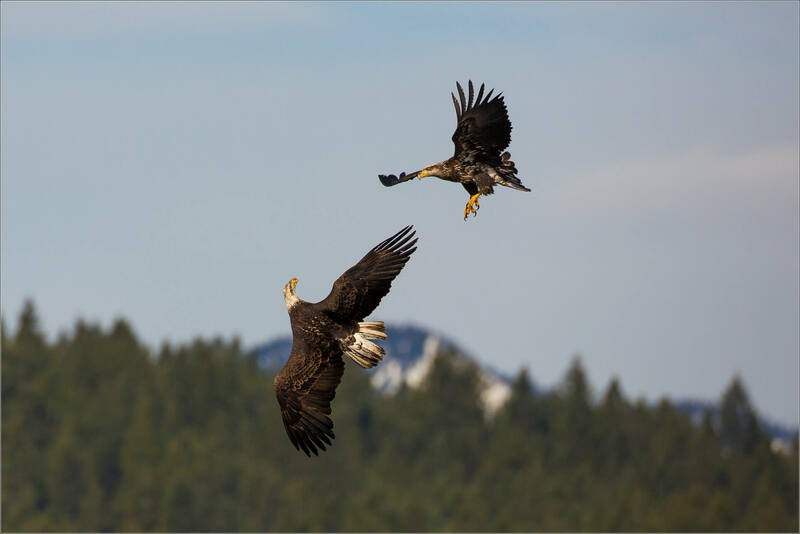 One of these saw one eagle fly back towards where I was standing. 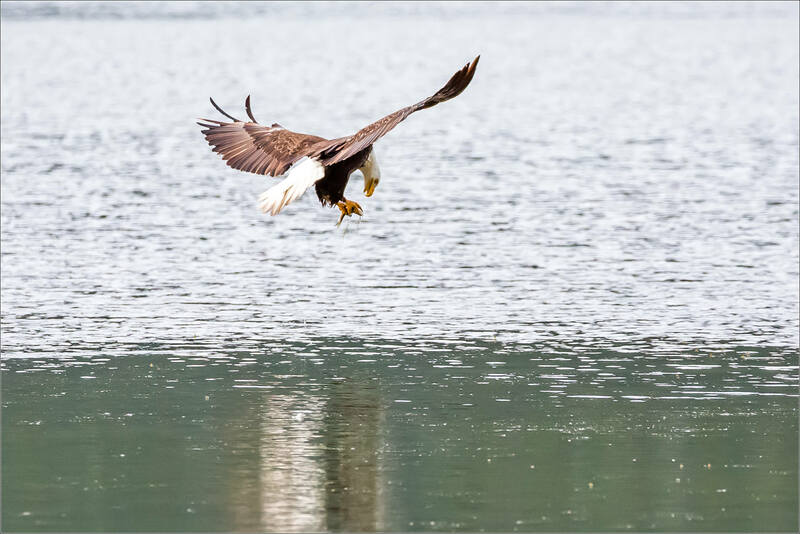 That provided a great opportunity for a few in flight shots. 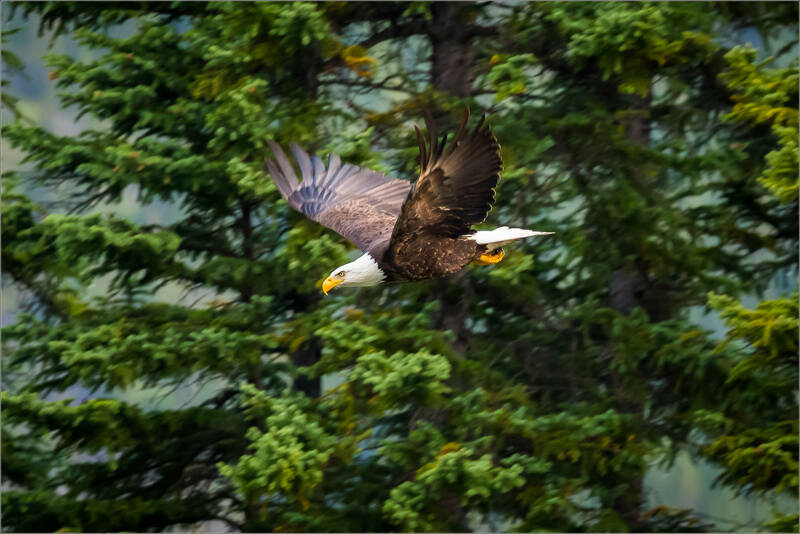 This eagle flew past me and far beyond before landing so I did not take any photographs of the meal. 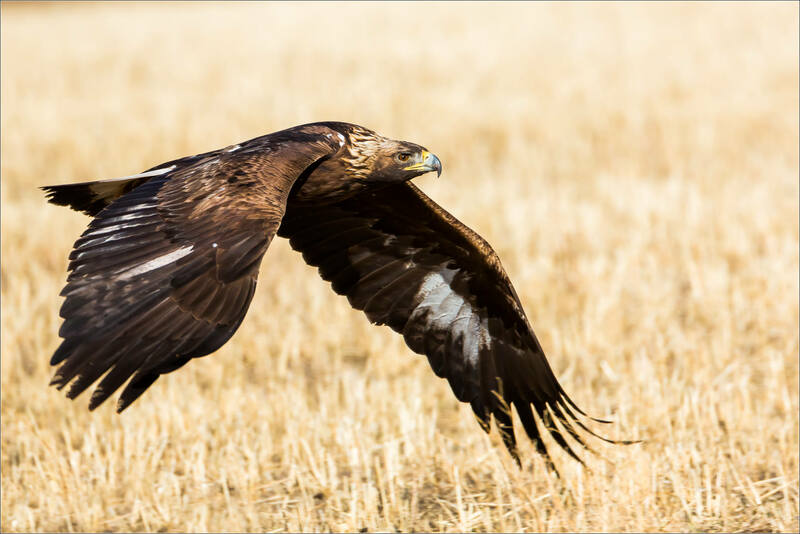 If you are interested, I have posted here previously of another eagle from the same day that I found eating from a perch in a tree. I realize that may be unappealing – but some people are interested. 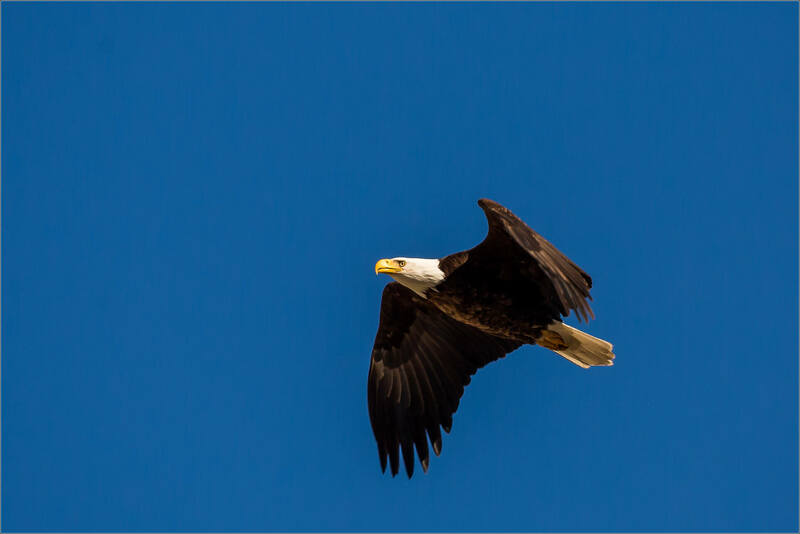 Either way, here are a couple more of this eagle as it passed overhead. 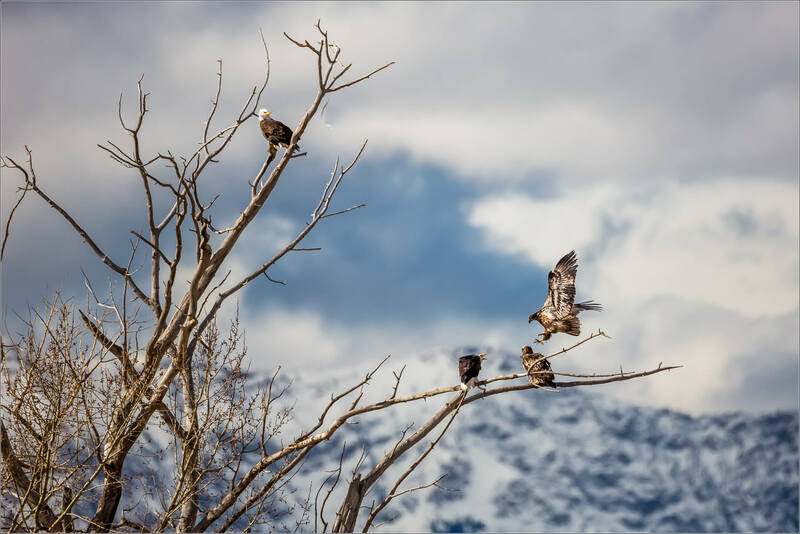 A couple of weeks ago, a raven’s cawing drew my attention to a small line of trees near the Springbank airport. 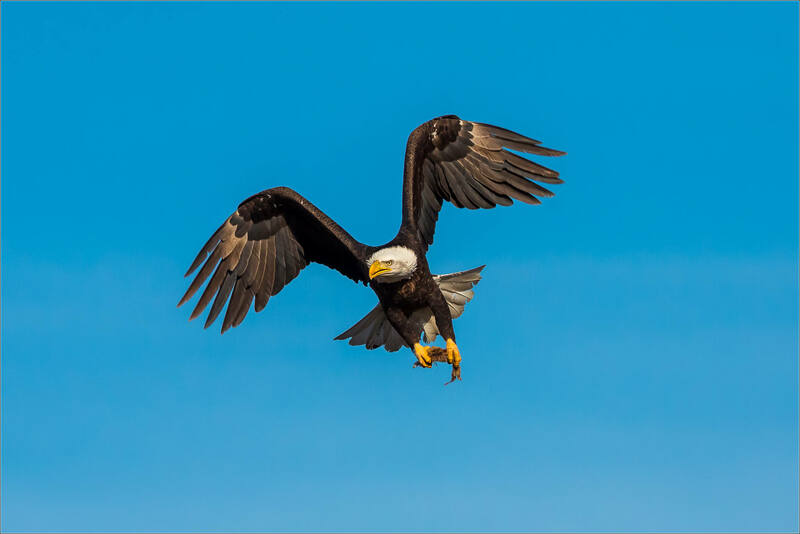 The raven’s dark shape was fluttering something and when I got a little closer I could see this bald eagle. 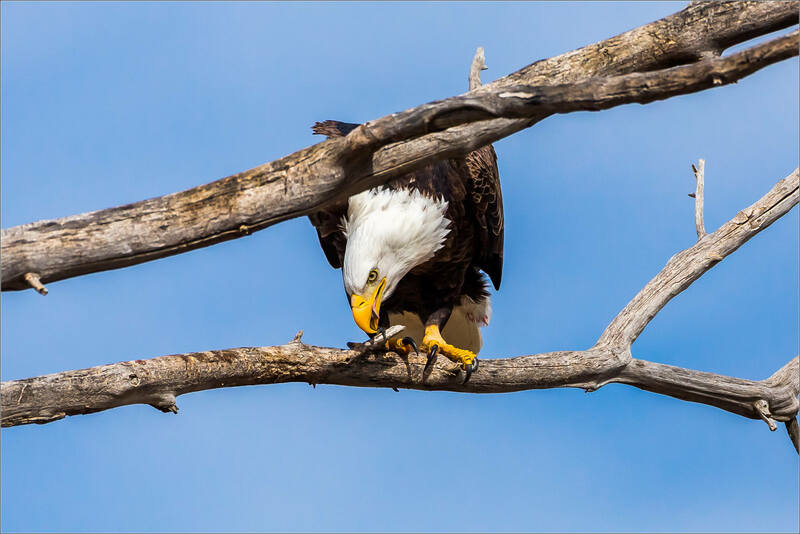 It was lunchtime and the eagle was not interested in sharing. 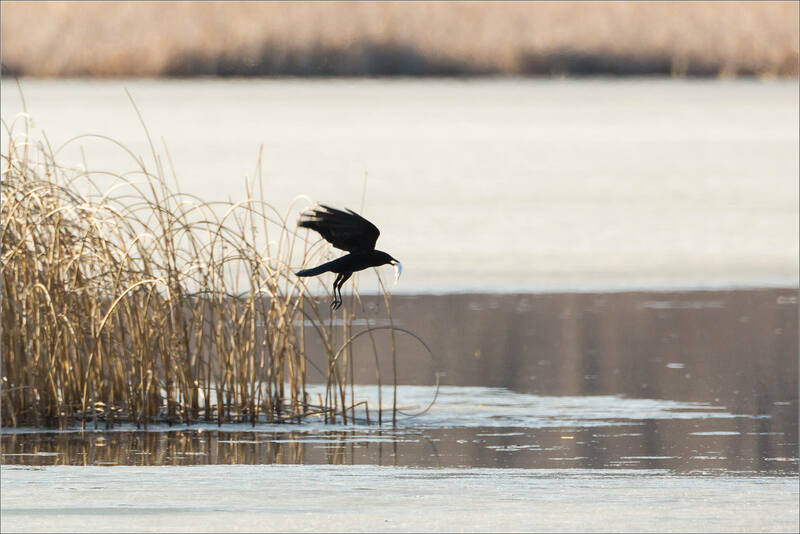 The raven soon took off and left the eagle to finish the prairie dog just caught in the surrounding fields. 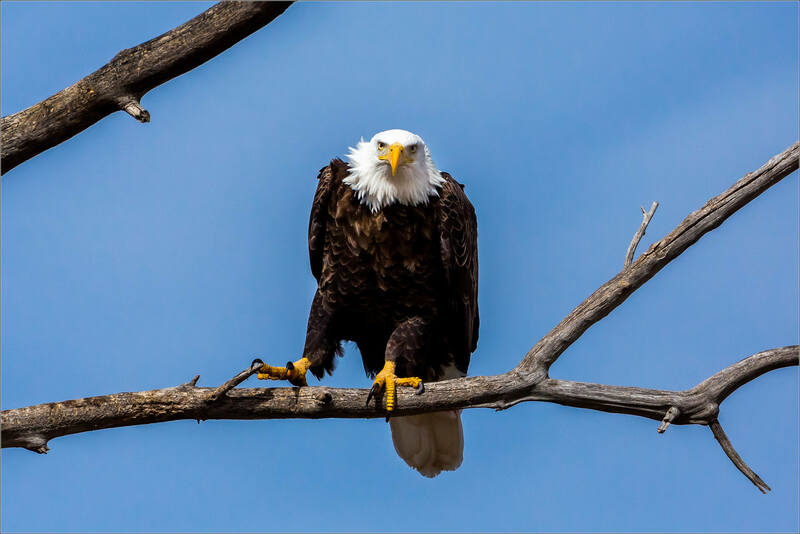 The eagle gave a few hard stares to the occasional magpie that came by but for the most part lunch went uninterrupted. 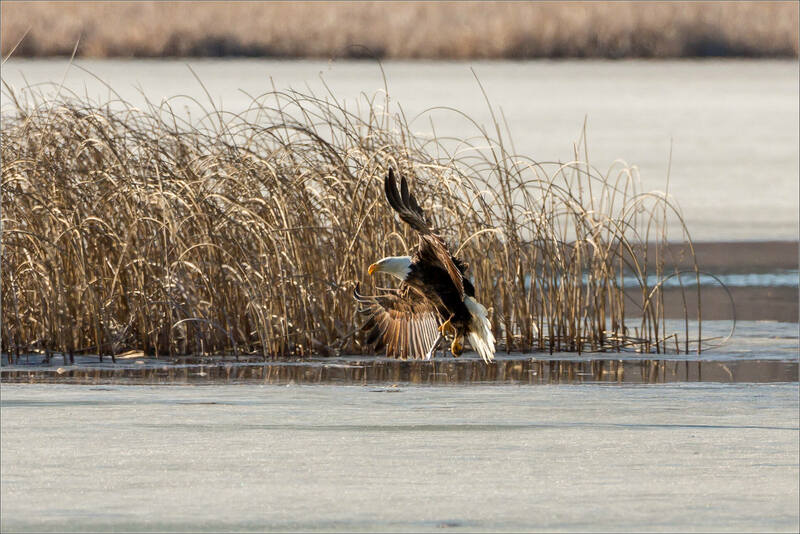 This year I have photographed a pair of Bald eagles who nested at the Mount Lorette Ponds. 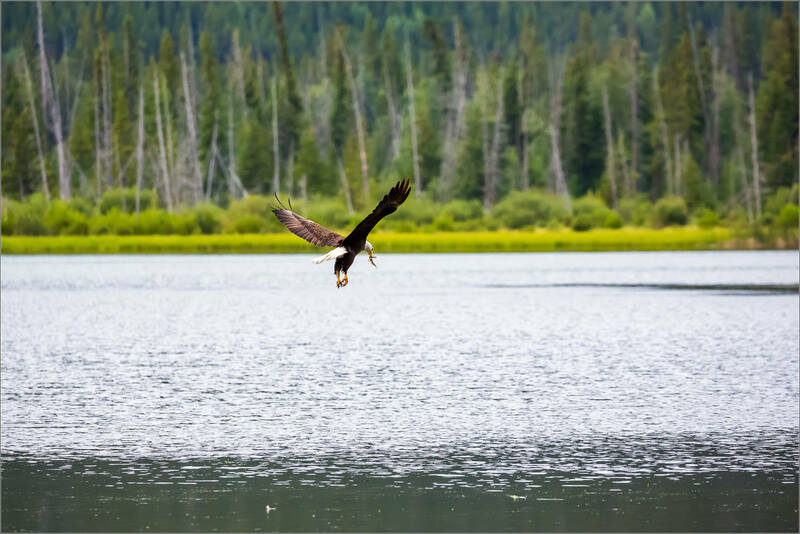 These small lakes in Kananaskis are stocked with Rainbow trout most years so these eagles have obviously found an excellent location to summer. On this morning in mid-August the day took a little while to warm up which saw both birds perch in the trees nearby. I waited for a couple of hours for a fish catching run with no luck. The luck I did have was watching these two beautiful animals as they surveyed their land below. 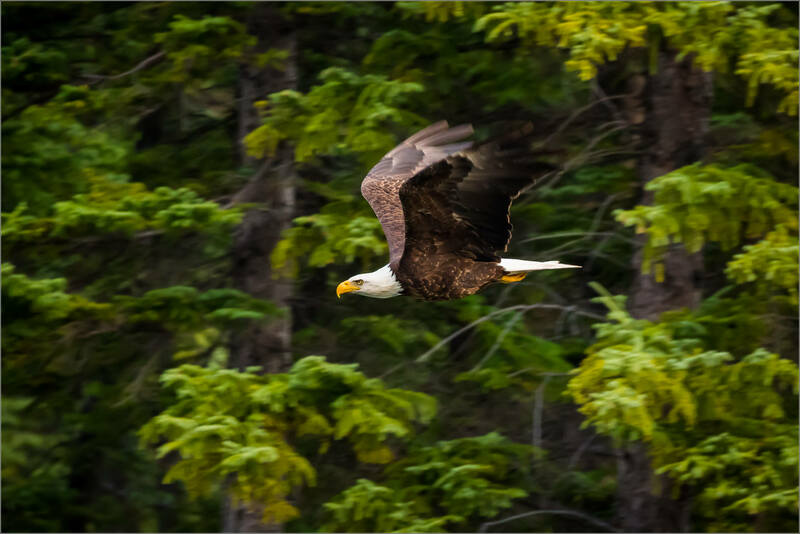 One eagle was more active early and flew to different trees a few times before disappearing into the forest above the water. 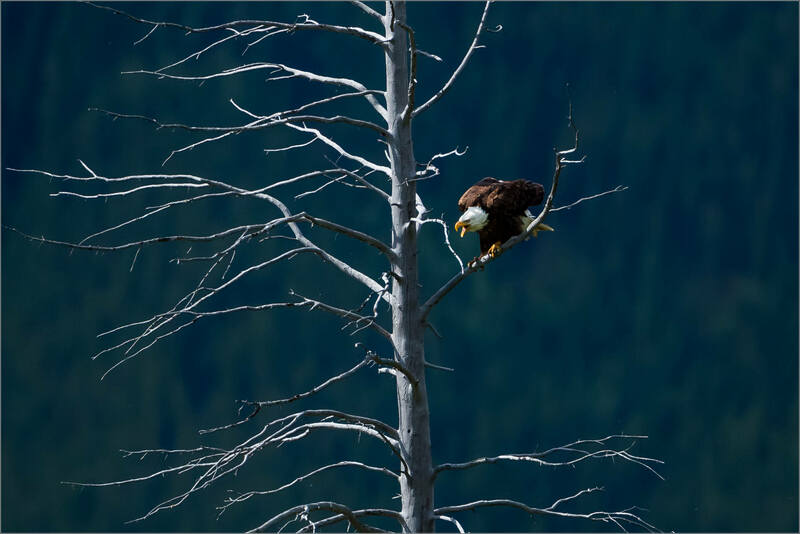 I hiked around for a bit before returning and finding one over the water again while the other perched on the edge of that forest. 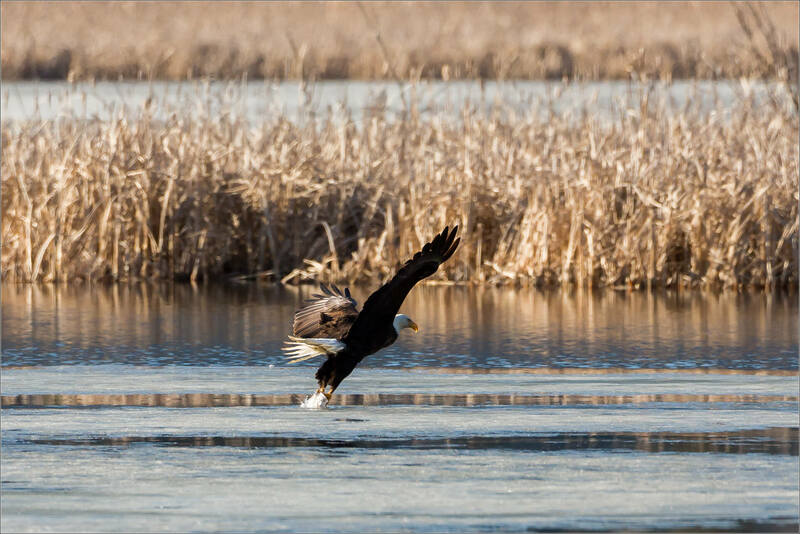 I watched this eagle glide across the Vermilion Lake from its nest on the far side. Ahead of his arrival on the shore in front of me, waterfowl and a couple of Great blue heron scattered in all directions. 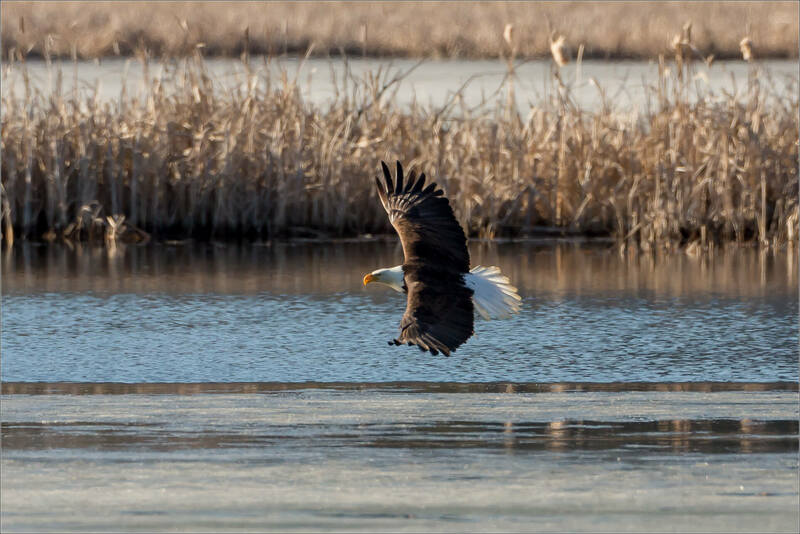 The eagle flew higher and circled a couple of times, staring into the water. 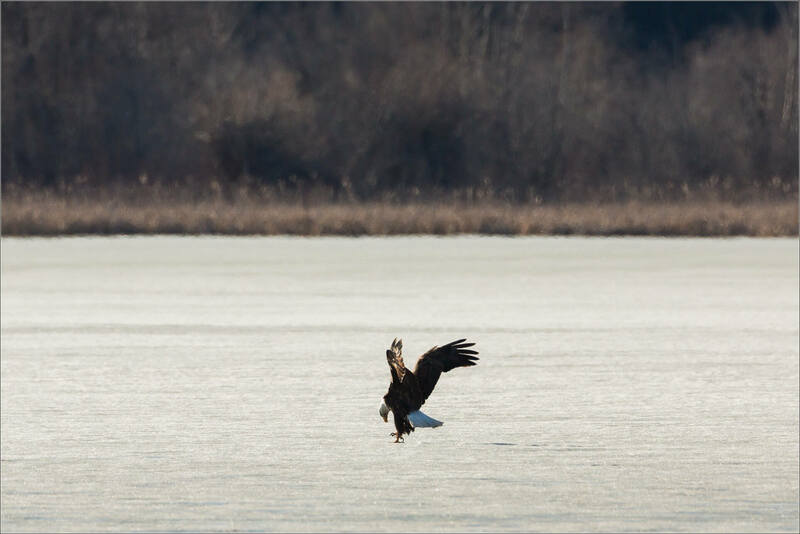 He dove, his claws slicing the water, but finding no joy. The raptor pulled up into a branch of a dead tree to reconsider its approach. Twenty minutes passed before his second flight. 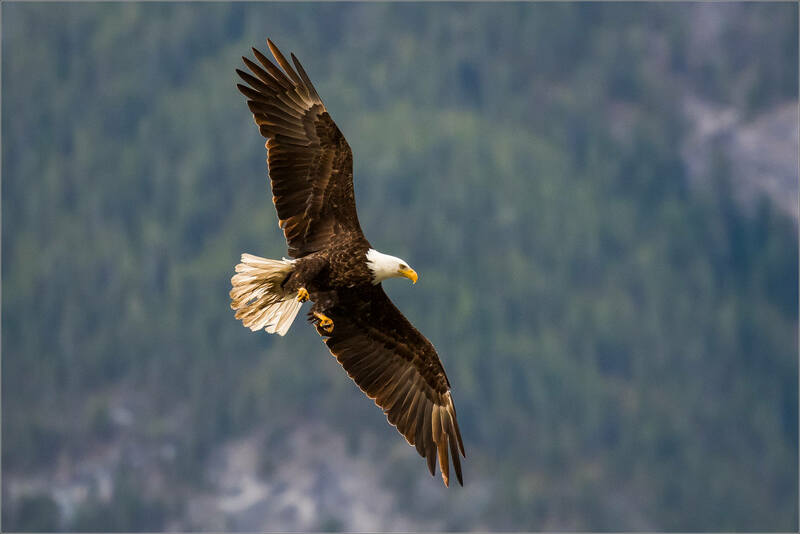 He flew in a wide arc, gaining a little more altitude. 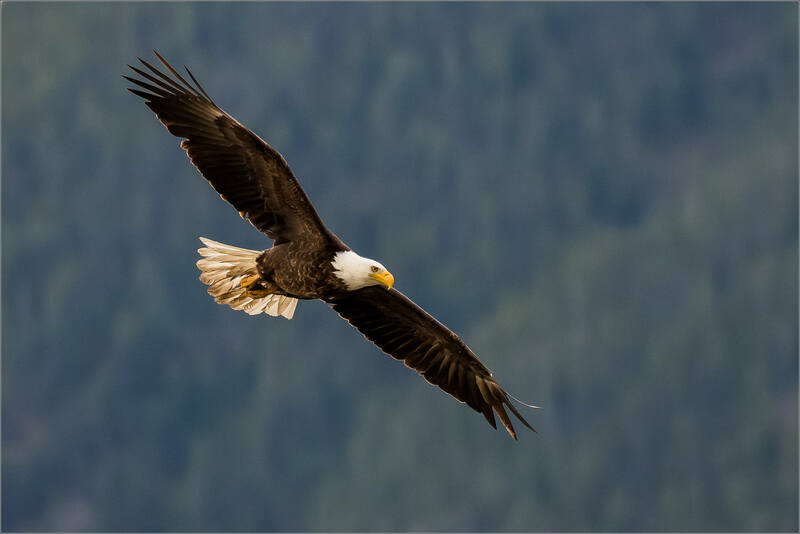 The birds that had been on the water, had not returned so the eagle had a clean line this time. 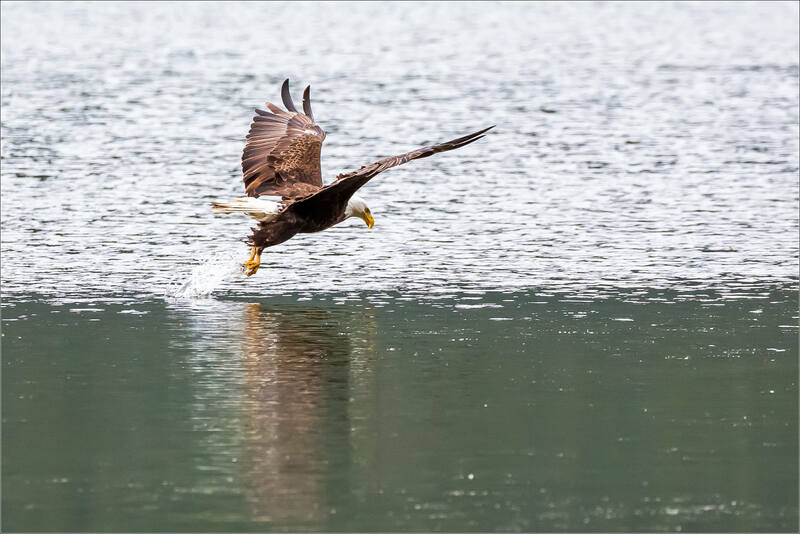 He dove, again, and this time his talons came off the surface with a fish in their grasp. 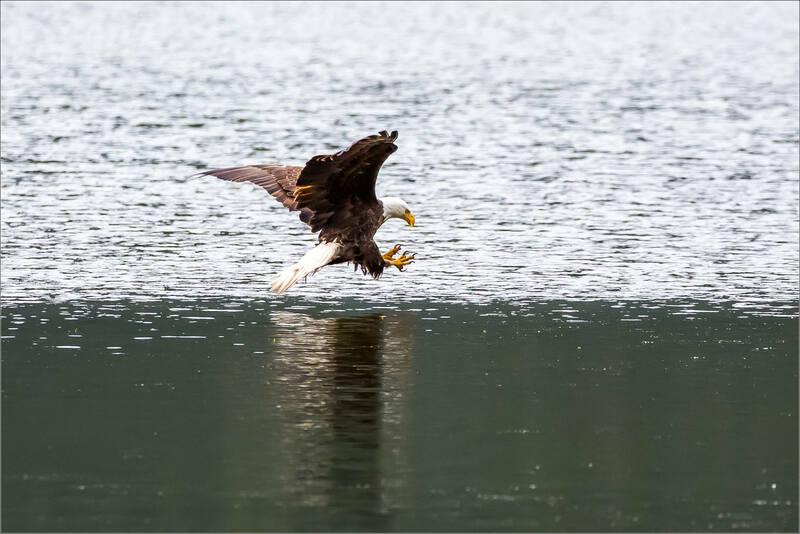 The fish was quickly moved from talons to beak and then swallowed mid-flight. The eagle flew back up to the same tree and settled on a branch near where it had been pestered by the blackbird earlier. From there, I hoped he would fish again and I waited for more than an hour. 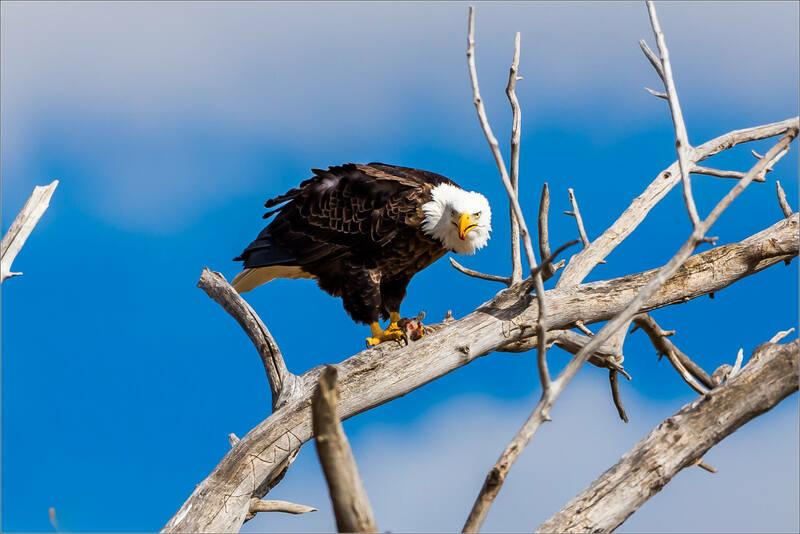 Along the way, he called out a few times which gave some interesting head and beak positions to photograph. 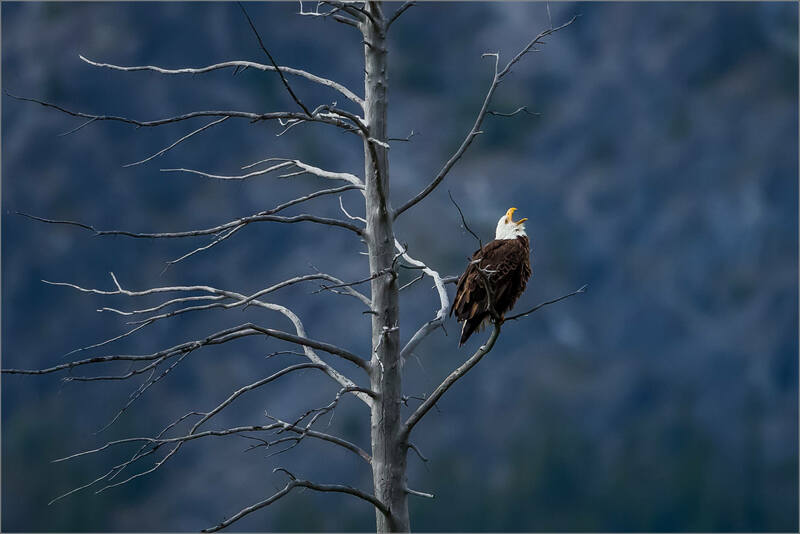 This Bald eagle perched along the southern shore of the first of the Vermilion Lakes in the Banff National Park. A Redwing blackbird did not like this visitor and buzzed the much larger creature. 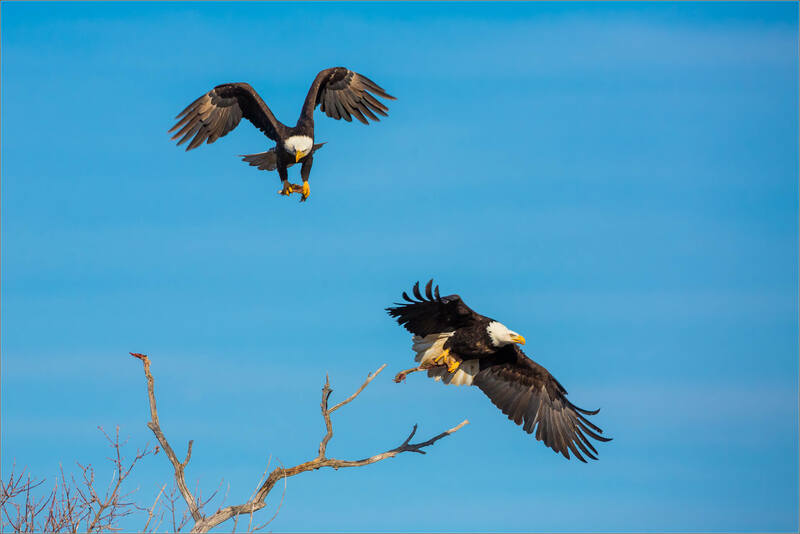 Watching these two eagles for an hour back in March, I am convinced they are the pair who will occupy the large nest perched in these trees over a pond on a farm on the high prairie east of the Crowsnest Pass. Both had no difficulty catching the ground squirrels in the fields surrounding the pond. 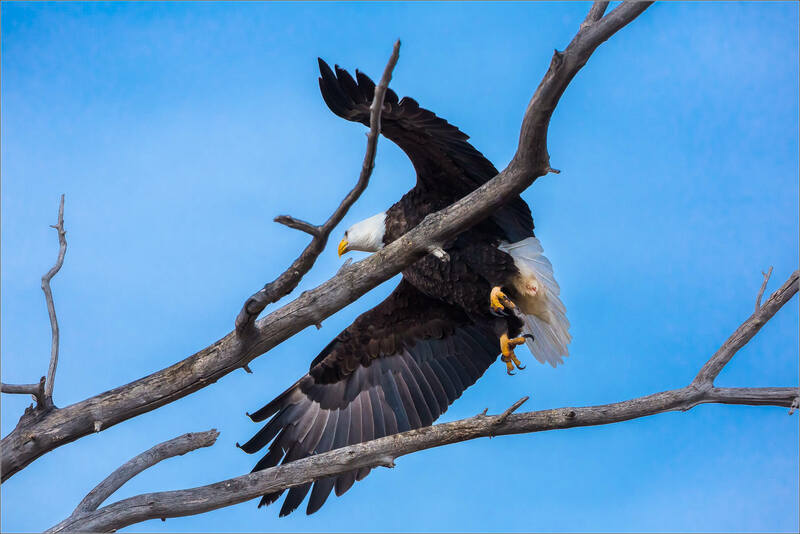 When they did, they returned to this branch to eat – possibly for the company. It was very cool to be a stone’s throw away from the wonderful creatures. At close range, I was reminded how big these birds are. 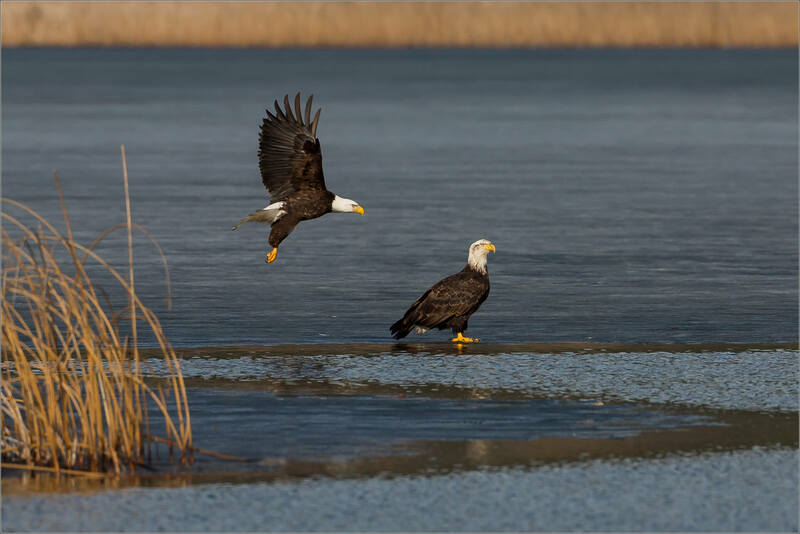 Other eagles circled the water as well but none seemed paired up like these two which leads me to believe they “own” the nest. I’ll get back there soon and see where things stand now! There were a lot of fun shots to choose from which I whittled down to these few here. It was, obviously, a well spent afternoon by my standards. 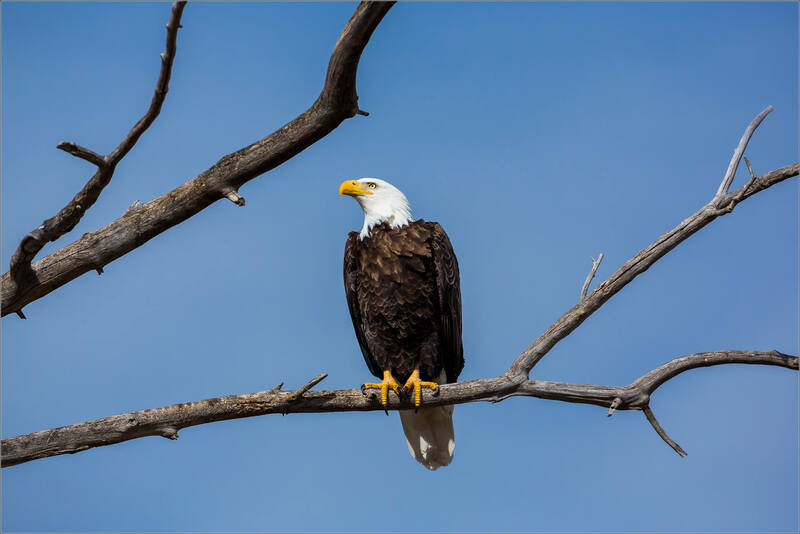 The Bald eagles in the Livingstone area have held my attention for more than a full day and I’m looking forward to getting back there soon. I am wanting to catch one of their attacks on the Richardson ground squirrels that blanket the fields. 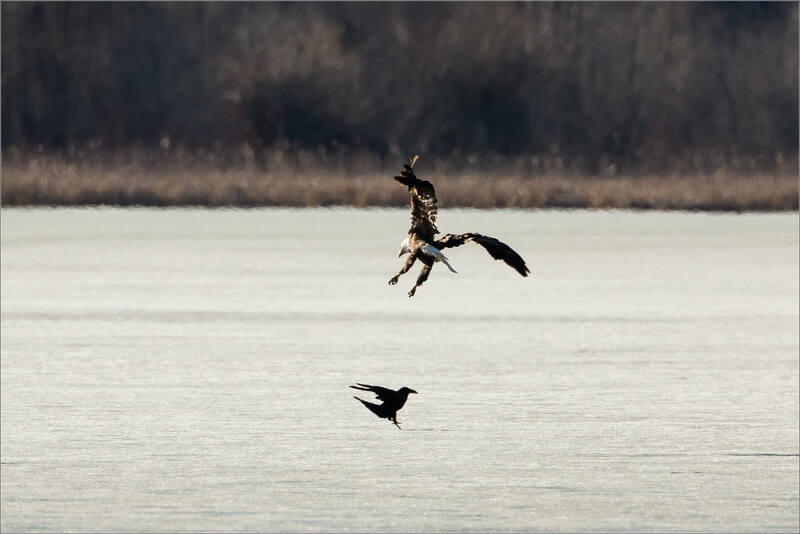 The last time I went out, this immature eagle flew in front of me and I thought it might find one. It didn’t happen then but the opportunity for in-flight photographs was wonderful. 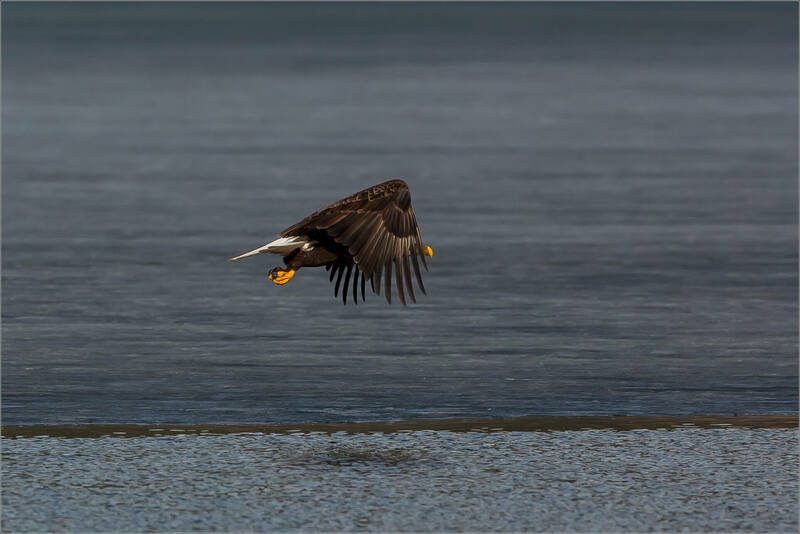 With the steady wind that was blowing, this near-mature Bald eagle only had to open its massive wing to take flight. 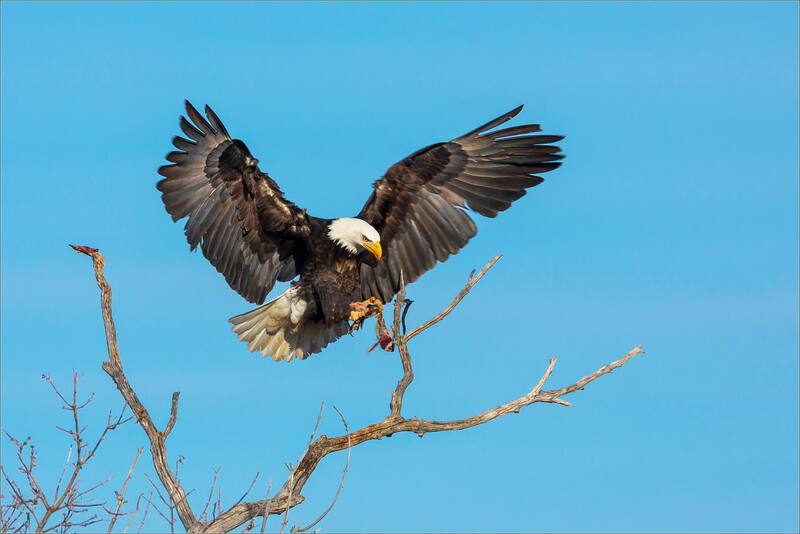 With the ~2 metre wingspan it easily glided over to a neighbouring tree where a couple other eagles were perched. 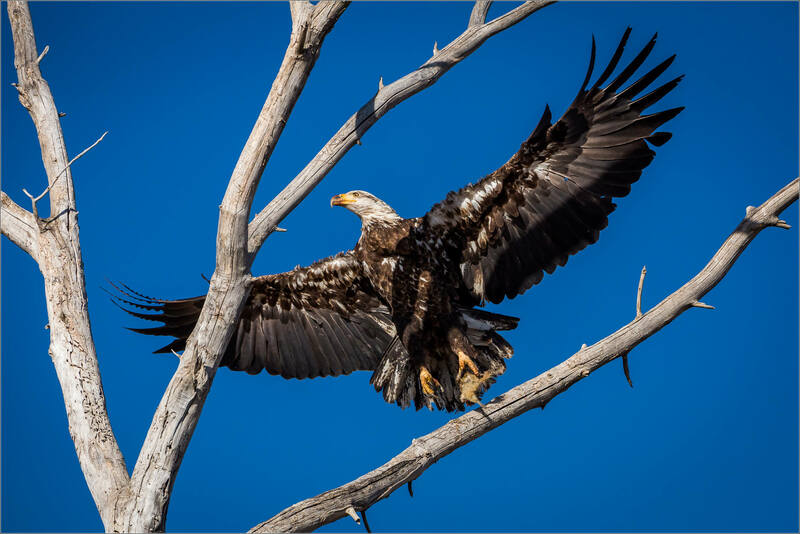 It was another great weekend on the high Prairie east of Lundbreck watching eagles. 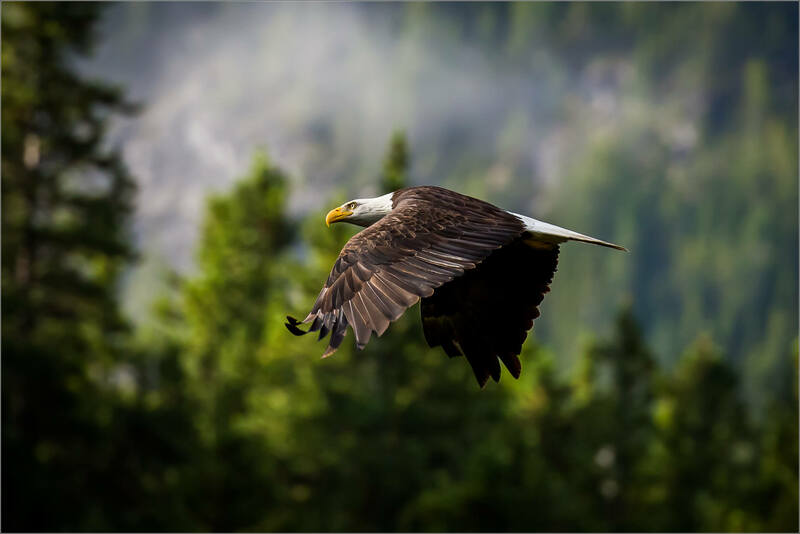 Watching birds in flight is a source of great pleasure for me. Perhaps it’s the freedom I imagine they enjoy (written just as two ravens glided by my window, acrobatically playing on the air currents outside) or the grace that many of them carry into the sky. When I have the gift of watching them close to the ground, it gives a different perspective and one that I particularly enjoy photographing. 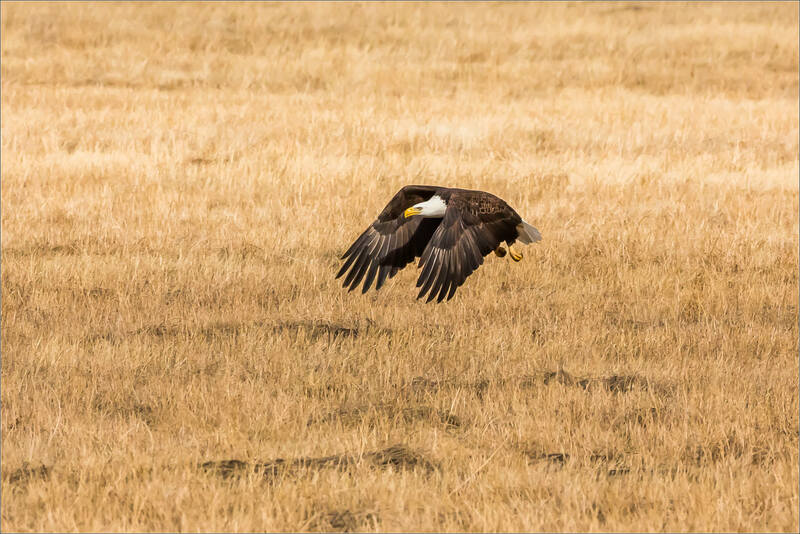 So when two of the four bald eagles that watched for quite a while on the weekend glided off of their tree perch and landed out on the field nearby, I was excited. I had hoped they may dive on the prairie dogs as they passed by. They did not, it seemed that an alert had gone up as the little creatures were nowhere to be seen at that moment, and they alighted in the short grass. They chirped a little at each other but it seemed like they were just enjoying the sunshine as they stood in their respective spots for close to ten minutes. 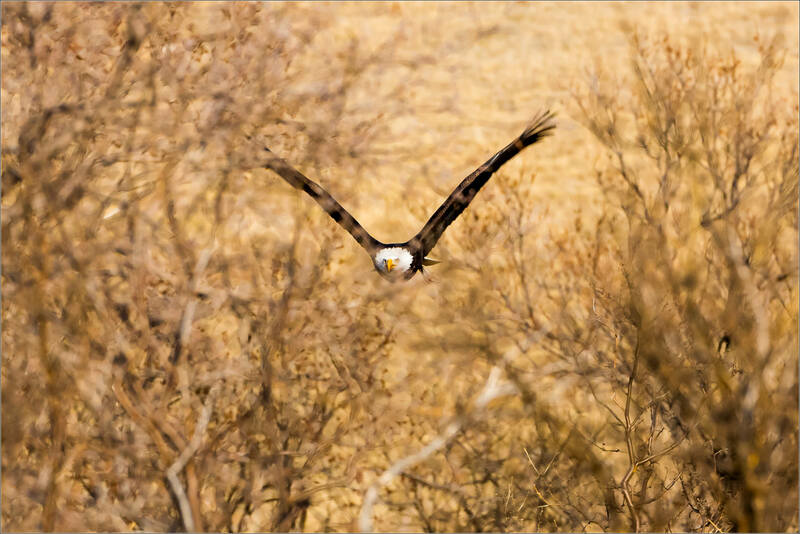 The adolescent launched first – I wanted to blur the wings in flight so I dragged my shutter. I’m still evaluating those results – we’ll see another day if I think they are worth sharing. 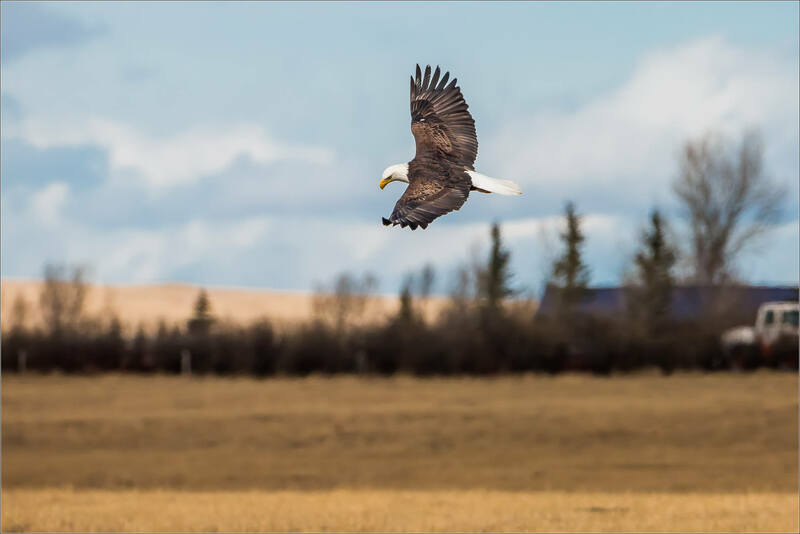 When the mature eagle lifted off the Prairie, I kept the shutter speed fast to freeze the motion and panned with the beautiful bird as it powerfully drove past. 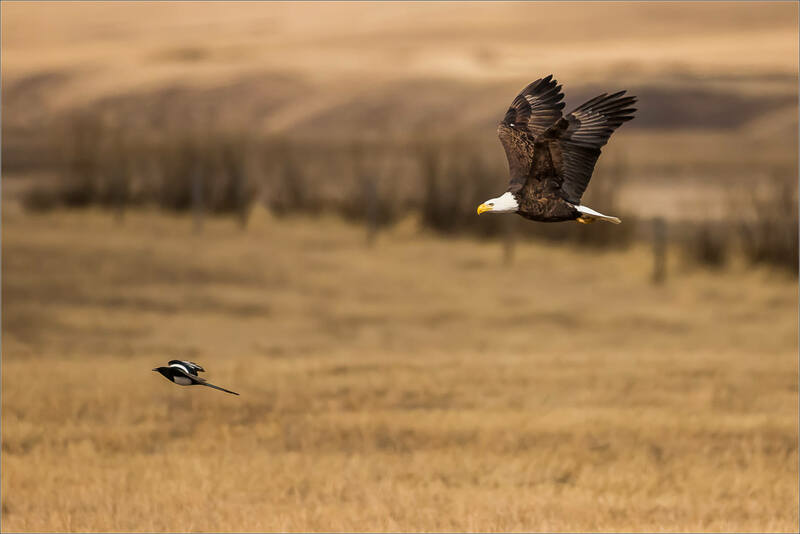 When it buzzed a magpie that had also been sitting in the field, that bird flew up and in front of the eagle for a short ways. 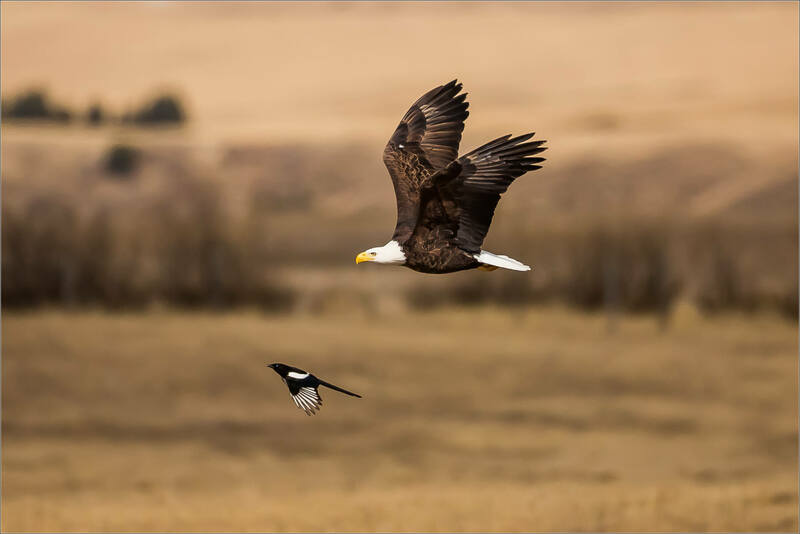 The eagle’s eyes were on this diminutive cousin of the raven and the crow but it was undeterred as it flew back towards its small convocation. As it gained a little altitude, I liked the way the elements in the background looked in soft focus. 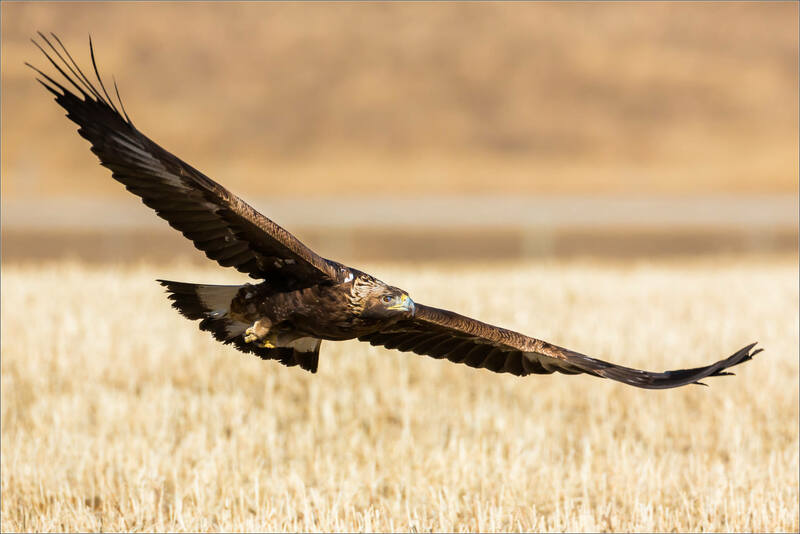 At one moment during this short flight it did look down at the field at one point – again raising my hopes of a dive – but nothing like that came of it. 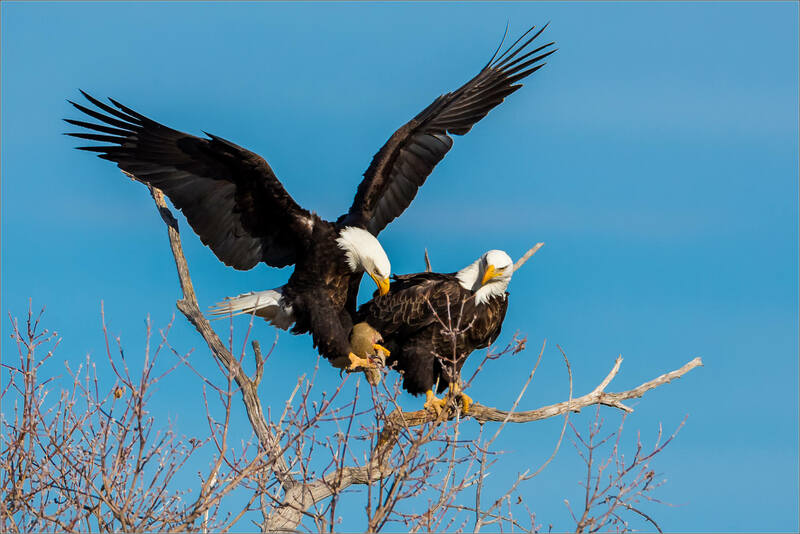 Both eagles rejoined the other two that had remained in the tree. They all remained there for an hour before hunting over the fields individually later. 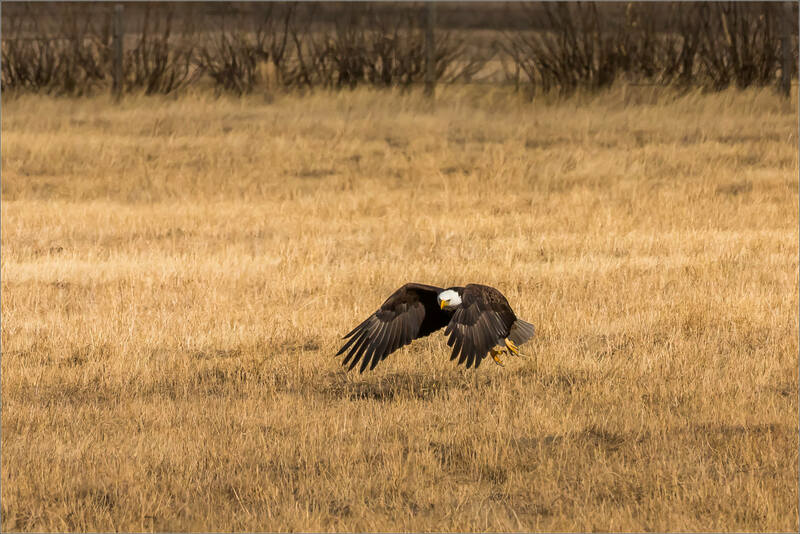 I found an aerie of four Bald eagles east of the Crowsnest Pass this weekend. They perched in still dormant trees that divide up several farm fields. From these perches, they can hunt for the ground squirrels that scurry between their holes among the short grass. 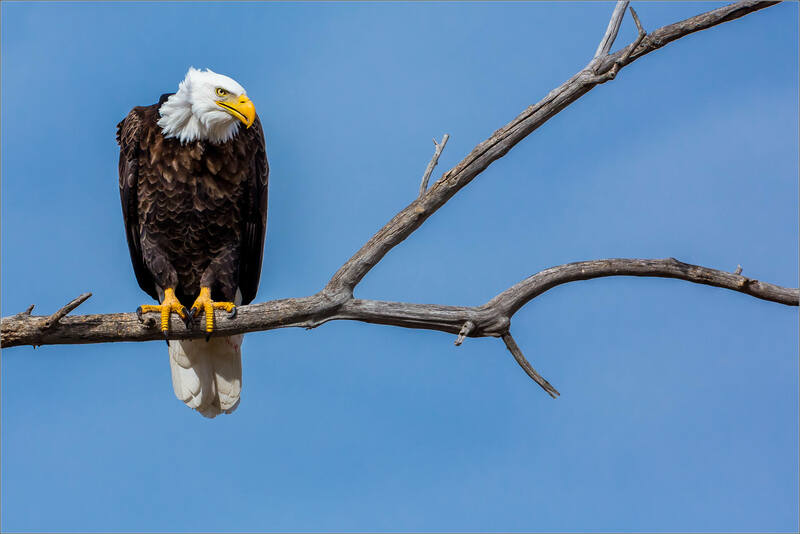 This eagle had just finished his meal and I caught him adjusting his position on the branch. It looked a bit like a line dancing sidestep to me.